England have opened the scoring against Czech Republic after just 24 minutes thanks to some lovely work from attacking trio Harry Kane, Jadon Sancho and Raheem Sterling. Harry Kane picked up the ball in the final third and let off an inch-perfect first-time pass into the path of wing wizard Jadon Sancho. 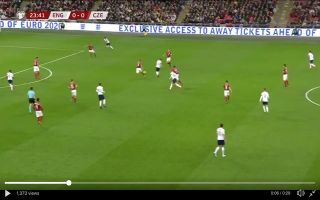 The pass was so good that all Sancho had to do was play the ball across goal and Raheem Sterling was on hand to slot the ball into the back of the net. England are lucky to have an exciting front three available to them and it’s great to see that the boys are playing with such a great chemistry. What a cracking way to get the Euro’s qualifiers off to a start; could Kane, Sterling and Sancho fire us to victory in 2020?